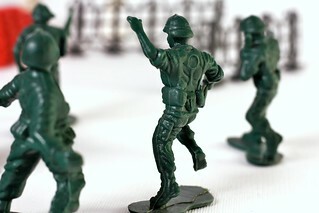 Green plastic toy soldier wearing World War II military gear and simulating the fall after being shot. Next to it there's another one throwing a grenade into the enemy camp. In the background there are two barb wire fences.